AMTECH™ Plug valves are designed and manufacturers s per standard norms and variety of materials.CS body,CI body,SS 304, SS 316 body and Bronze / GM Plug valves have end connections as per customer requirements. We offer plug valves have Screw end ,Socket Weld End and Flanged End connections. 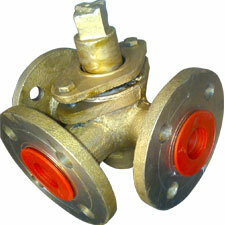 We have two way as well as three way Plug Valves. Non-lubricated plug valves contain a polymeric body liner or a sleeve, which is installed in the body cavity. The tapered and polished plug acts like a wedge and presses the sleeve against the body. The nonmetallic sleeve reduces the friction between the plug and the body. Like for soft-seated ball valves, non-lubricated plug valves are limited by temperature and chemical compatibility of the non-metallic materials used. Non-lubricated plug valves are used instead of lubricated plug valves, where maintenance needs to be kept to a minimum. They can be used in special services (e.g. sulphur and hydrogen fluoride), since they do not have a body cavity in open communication with the flow when switching, where fouling liquids could be trapped or solidify, potentially jamming the valve. These valves are not torque seated.